This is an acute and highly contagious disease with gasping and spitting of blood. The lining of the windpipe swells up and sometimes the bird chokes to death. Sometimes this disease is contracted at poultry shows. Many fanciers who show their birds are sure to vaccinate for Laryngo. 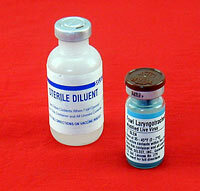 Vaccinate healthy birds 4 weeks of age or older, with an eyedropper. 1,000 dose bottle. Once open, discard any unused vaccine. Vaccines are shipped in an insulated box with ice packs. A boxing and handling charge of $25.00 will apply. Up to 4 vaccines can be put into one box. Vaccines must be delivered within two days, express shipping cost will also apply and can only be shipped Monday-Wednesday. A signature is required upon delivery. VACCINES CANNOT BE RETURNED. We cannot ship this vaccine to AZ,CT, TX, or MI or Canada. Is this a modified live vaccine?